SUMMARY: Selected by novelist Stewart O’Nan as winner of the Autumn House Press fiction prize, What You Are Now Enjoying takes us into both the uncanny and the mundane. From Wonder Woman as an angst-ridden teenager to ghost twins to monster catfish to the secret relationships between polygamous wives, the stories in What You Are Now Enjoying approach the familiar in unfamiliar ways, allowing us to recognize and claim the unordinary moments in our own often ordinary lives. In particular, Gerkensmeyer crafts broken fairy tales that reimagine the life of women. THE BACK STORY: I’ve been working on a novel for almost a decade now (and it has felt like almost ten different books over that time). After the birth of my second son, I couldn’t muster the focus to return to work on the novel while he was a newborn. Instead, I allowed myself to “play” with very short stories during his sporadic naps. I didn’t think those pieces would really go anywhere. But after I had written a few of them, I saw that they could tie my other short stories together into a collection. So this book was a very big and wonderful surprise for me. And I think that surprise is such an important element for any writer–whether it appears in a single sentence, or a chapter, or within an entire project. WHY THIS TITLE? : I was lucky to have to feedback from my agent on the title. She loves the title story. And I realized that I liked the idea of beginning the collection with a set of younger characters (women just barely out of college and trying to figure out their next steps). I then ended the collection with “The Cellar,” which features an elderly couple looking back on their long life together. This created a really helpful thematic arc within which to structure the other stories in the book. WHY WOULD SOMEONE WANT TO READ IT? At readings and panel discussions and other book-ish events, I often find myself self-consciously describing my writing as “weird.” And I’m honest about the fact that I don’t ever want the strange qualities of my writing to ever overshadow my characters and their authentic human experience. This description of “weird” that I have given myself seems to draw a lot of new readers in. I think many of us have an urge to experience very ordinary life moments in a fresh way, especially when we are listening to or reading stories. REVIEW COMMENTS: “The smart, funky, well-turned stories in What You Are Now Enjoying keep the reader not just guessing and leaning forward but in a perpetual state of wonder. 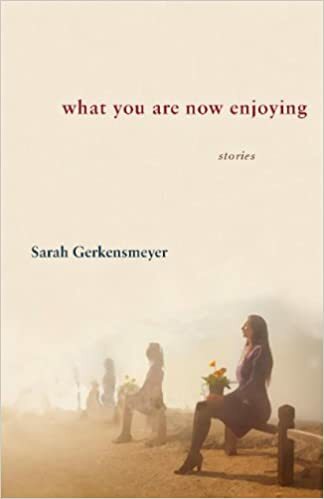 Sarah Gerkensmeyer is an original, a sneaky sorceress of a storyteller.” — Stewart O’Nan. AUTHOR PROFILE: I became a short story writer in the first grade, when I was allowed to choose my morning activity everyday. I penned “Surfing in the USA” parts 1 and 2 during that time, along with a number of other masterpieces that were never fully recognized. But in all seriousness, the spark hit me then as a young girl. I lost touch with it over the next few years, and it wasn’t until college that I remembered that I just had to be an author. In a poetry seminar my senior year, my soon-to-be partner and then sometime-after-that-to-be husband wrote a beautiful poem about another woman. I was hooked and told him I’d like him to write a poem about me someday (and he did). It’s the power of language and how it can change a life so fully like that in a single moment that I will always love and pursue. Any publication or book or award or other recognition that comes along with that is just extra. AUTHOR COMMENTS: For me, writing fiction has been a process of coming home. I was born and raised in Indiana and I did not recognize how growing up here shaped my work as a writer until I had been living elsewhere for a few years. When I wrote my first story with overtly surreal elements in graduate school, I was completely surprised by the sudden turn of events and almost scrapped the piece. I’m so glad I didn’t. I think the sense of longing that often fills my stories was partly attached to my own homesickness during those early years. I was also able to recognize the strange and the odd tucked within Indiana once I had moved away. Things like heat lightning and humidity as thick as oil and the common experience of crouching beneath a utility sink in the basement while waiting for a tornado to rip on by. There is so much sharpness tucked within the mundane here, and I’ve been fortunate to move back here with my family. At the end of October, I was just recognized with an Indiana Authors Award, and this was the icing on the cake of coming home.